Thousands of labour and organization protests spread across the country following the fall of Hosni Mubarak. Although protests are sporadic, they have a common set of demands: Fair wages and eradication of corruption. In one day, in downtown Cairo, passersby could cross a group of workers of Nile Enterprise for Cotton staging a sit-in in front of the prosecutor-general's office, a group of teachers outside the ministry of education and employees of the recently privatized chain Omar Effendi protesting at the company's headquarter. Three main demands emerged in most of the protests. The first is for better wages, usually consisting of a minimum wage of LE1200 or in some cases asking for a maximum wage to be determined in function of the minimum wage within the same institution. Fighting corruption was another prominent demand and one which, in most of cases, targeted the chairman of the company or head of a ministerial authority or syndicate. The protesters also demanded the hiring of temporary workers as well as addressing the lack of job opportunities. These labour demands divided the revolutionary youth. These protests were also not welcomed by the new military rulers of Egypt who accused them of harming the economy and the revolution. 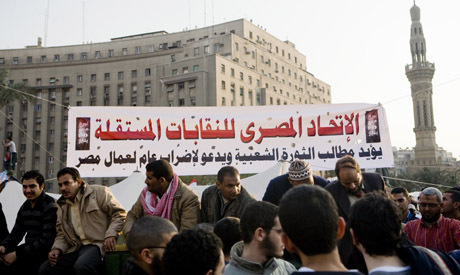 The Egyptian Trade Union Federation (ETUF), whose leading officials were appointed by former president Mubarak, asked workers to stop protesting. “Stop these protests. Most of the protests are asking for wage rise, or the removal of chairmen and so on. This is a kind of extremism,” says Ibrahim El-Azhari, secretary general of the federation. He adds that the federation is preparing a paper with the problems of Egyptian workers including the demand for amendments to many laws. El-Azhari prefers to give the newly appointed government a chance to respond to the worker’s demands. On the ground, the momentum is rampant. Ghazl El-Mahalla, the largest spinning and textile company, led a successful three-day strike which lead to all their demands being met. Neither workers nor employers paid much attention to these calls for the protests to stop. A group of workers and activists published a statement defending their right to protest and declaring their solidarity with all the demands of the revolution. The workers of El-Mahalla have announced plans to create an independent syndicate separate from what they see as the corrupt Egyptian Trade Union Federation, in contrast to the law which stipulates only one syndicate to represent workers in each sector. Many others are considering founding independent syndicates, as the Post office employees, the public transportation workers and the nurses among others. Already, before the January 25 Revolution, four independent syndicates were created but struggled to gain legitimacy. The trend setter was a syndicate of the employees of real estate tax authority. Thousands of workers are not even members in any syndicate, especially those who work in private sector factories. Their bosses bully them so as to ban any sort of collective organization. EFTU often turns a blind eye to such behavior and fails to support private sector demands. On the other hand, rigged elections in federation syndicates further eats away at its credibility. “Elections of the federation of syndicates witnessed lots of fraud," states Kamal Abbas, general coordinator of the Centre for Trade Unions and Workers Services. "There are 116 verdicts of administrative court annulling the last union elections and we believe members of the federation were involved in acts of violence against the protesters in Tahrir,” added Abbas. Hesham Fouad, an activist from the Centre for Socialist Studies, believes that by the end of the year an independent syndicate federation will be established in Egypt. Kamal Abbas, shares this belief. With their rigid mindset locked in the falling past, the federation sees this as a nightmare. “The pluralism will separate the workers and will break their union, besides the law doesn’t allow it,” replies El-Azhari who admits that syndicate pluralism is successful in other countries, like Germany. But he doesn't believe that Egyptian workers are up to this challenge. Drunk with the revolution spirit, the workers and activists don't pay much attention to what the law does or doesn't permit. “We should create our independent syndicates according to the international convention that Egypt ratified. We will do as our grandfathers did before 1952 when the first unions were created in Egypt,” says Abbas. Activists and the official federation were also at odds over whom to nominate minister of manpower. Ahmed Hassan El-Borai, an expert in labour relations who elaborated the controversial unified work law of 2003 but has also stated his support for trade union pluralism, was proposed for the post. The federation objected to his nomination and suggested one of their members, Ismail Ibrahim Fahmi who happens to also be an employee of Egyptair which was headed by the prime minister, Ahmed Shafiq. The federation won and Fahmi was nominated minister of manpower. The activists, however, presented an objection to this appointment before for the military's supreme council yesterday.